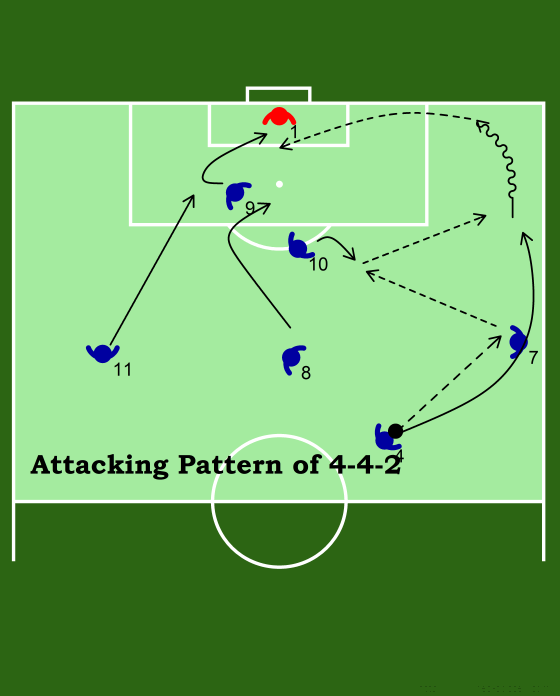 Holding midfielder #4, plays ball into far foot of the outside midfielder #7 and runs to the outside of #7 in an overlap. #7 carries the ball inside and passes into feet of #10 who is checking back for the ball. #10 receives in maximum of 2 touches and plays ball into space for #4 to run onto. # 4 dribbles ball to end line and prepares to serve the ball into the box. #11 should be moving into a back post position as well as #8 moving toward the penalty spot on a bent run. #4 preps the ball and serves cross between the top of the 6-yard box and the penalty spot for #9 to run onto to. #9 finishes the ball in the direction that it came from into the near post either with a volley or a header.